Living and master bedroom face Grange Road. Good sound proofing from sliding doors in living area and windows. Living/dining - light brown marble; bedrooms - parquet. Master bathroom with white long bath tub and bowl-type wash basin. No separate shower stall. Common bathroom. Big shower stall. Facilities: Small pool, Covered car parks, 24-hour security, small balcony, no children's pool. 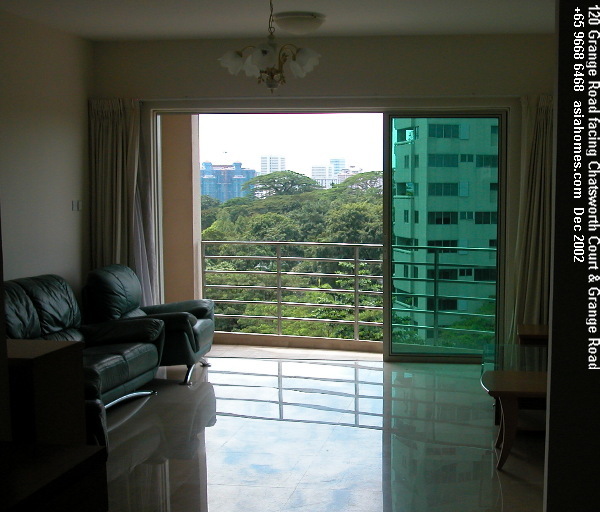 Popular with single expatriates as this condo has few children, if any. 15-minute walk to Orchard Road or Orchard subway. Separate dining area (right) and large living area with balcony. Little traffic noise from Grange Road when balcony is closed. Bright and spacious modern master bathroom. No shower stall. 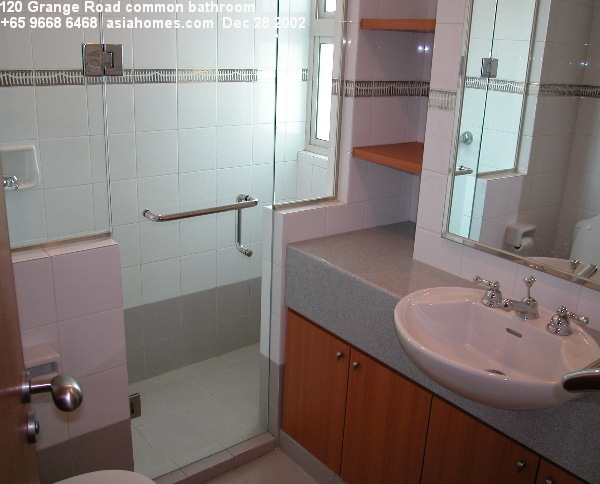 Common bathroom has shower stall (see picture below). Spacious kitchen. Good-sized maid's room (left) and utility area (right) outside the door. Low density ensures privacy. This factor appeals considerably to Caucasian expats. 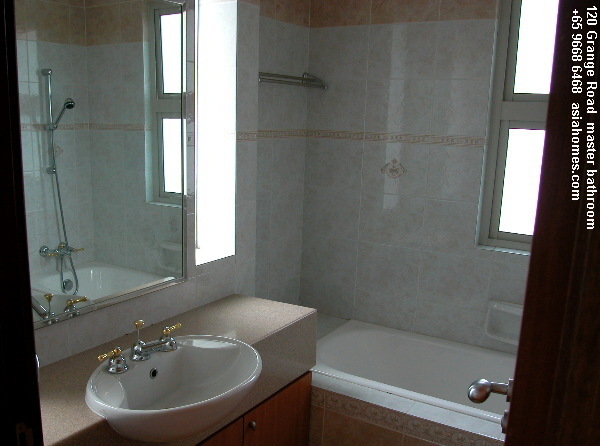 Modern pastel-coloured bathrooms appeal to Caucasians. Many taxis plying along Grange Road. Bright rooms, big kitchen and separate living and dining area. Size of nearly 1500 sq ft is appropriate for young Caucasian couples with their own furniture as newer condos are around 1,300 sq. ft. Maid's room (store room) is of good-size and utility area is big. Small swimming pool. No gym or tennis court. Advert by Realtor: Elizabeth Heights 3+1 2500 sq ft.
Young Caucasian Dutch couple with no children. Case study: Landlord: Should you be present during house viewing? 10 am Char Yong Gardens 3+1 1250 sq ft $3,500. 17-02. Unrenovated. 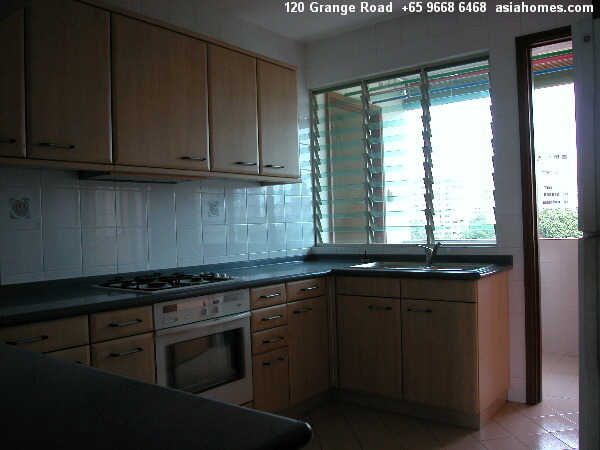 10.10am Char Yong Gardens 3+1 1349 sq ft $4,500. 16th floor with city views of Orchard Road and California Fitness Club. 10.30am Mutiara View 3+1 1200 sq ft $3,000. 11th floor. Breezy. Bright. 11am Shaw Plaza Twin Heights 3+1 1420 sq ft $2,800. 05-06 facing apartment opposite. No privacy. 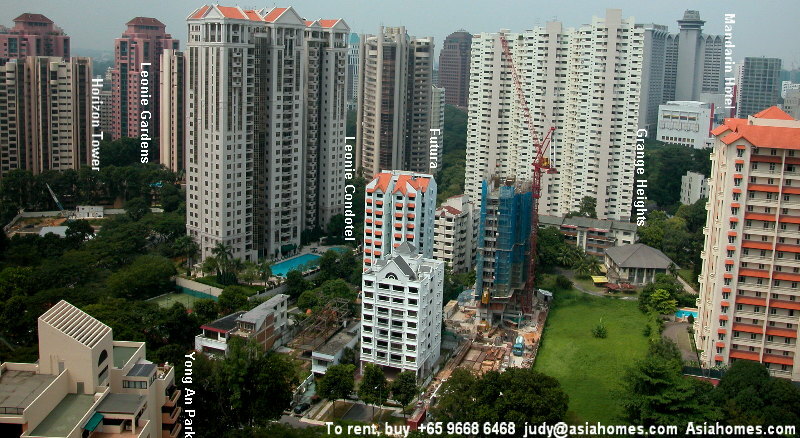 The units ending with ...-01 and ...-02 are facing Balestier Road and have better views. 11.30am 120 Grange Road 3+1 1400 sq. ft $4,000. 9th floor, 5th floor. The couple had seen over 30 condos with asiahomes.com realtors over past 4 weeks. They loved No. 6 Hullet Road's pinewood flooring and large master bedroom but the 3-bedroom rentals are over $4,000. Upscale Newton 18 condo was the best of the choices but the rentals are above $4,000. The 120 Grange Road apartment evoked an initial good-feeling to this couple - being low density with 18 units, near downtown Somerset subway where the wife works and a short bus ride to Suntec City where the husband works. It was spacious. Minimal traffic noise was heard when the sliding door of the living area was shut. An offer will be made to the Landlord. Case Study: Should Landlords be present during house viewing? "Why shouldn't I be there?" queried the Landlady of a Gentle Villa house when Asia USA associate suggested that she be absent in the viewing of her house (co-broking case). We don't reason with any Owner who wants to be present and welcomed her to be there. Many Singapore Landlords want to be present to screen clients but in a declining rental market, the important issue is to have early occupancy. Unless your house is in tip-top condition, it may become very embarrassing. In this case, the garden's carpet grass was full of weeds and painting was in progress. The house was not in a show condition but house viewing must carry on as workmen take weeks to do a painting and gardening ob in Singapore. Landlady is the Type A personality - a strong personality and in fact, holds a high management position. It might be uncomfortable for her if the Tenant wants to criticise the condition of her house. Caucasians are generally polite in front of the Landlady and will not offer any comments which can be countered/explained by the realtor. Viewing may number more than 50 and therefore it tends to be demoralising and this will show on the Landlady's persona. Many Tenants do see more than 50 - 100 houses and hers may be only one of several. Some Landlords have the type of "fierce-looking" aura and this turns off the Caucasian prospects of Asia USA. It is hard to define this personality but it can be sensed. The Landlady in this case does not have that personality but as her house was in poor condition, she might have to give explanation that the previous Tenant did not look after the house. It would be better for the realtor to say this rather than the Landlady who might feel angry. In any case, there is ample time to interview the prospect when a final decision to rent has been made. In this case, the Landlady could not make it as she had too many meetings to attend! 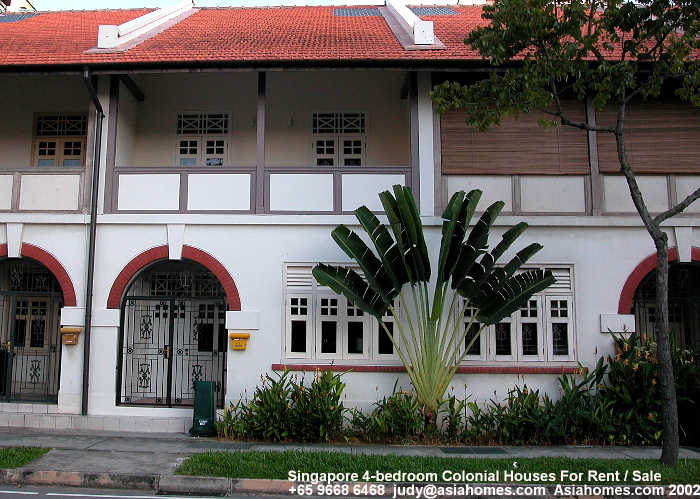 There are a few units for rent in the neighbourhood and much depends on luck too.